Laura Veirs is nothing if not prolific. In the past decade, the supremely talented singer-songwriter from Portland, Oregon has released no less than ten solo albums, a collaborative effort with fellow North American artists Neko Case and k.d. lang, written a children’s book about the life of the blues and folk musician Elizabeth Cotten, created her own podcast, Midnight Lightning, about the lives of working musicians who are also parents, not to mention starting her very own family with her husband, record producer, Tucker Martine. The couple have two young sons. And as if all this wasn’t quite enough, the consistently creative Veirs also tours. She is here playing a few dates in the UK, supported by Sam Amidon who is doubling-up as tour chauffeur, ferrying both musicians round the country in his car, carrying with them their respective guitars plus his banjo and fiddle. Assuming that Amidon is not behind the wheel of some big American gas-guzzler, it must be an incredibly economical way to travel. Our first sighting of Laura Veirs tonight is when she joins Sam Amidon for the last three songs of his set, the highlight of which is the concluding reading of Rosa Lee Watson’s highly emotive ‘Your Lone Journey’ in which Veirs’ and Amidon’s voices dovetail together in much the same way that Rosa Lee’s did when she and her husband Doc Watson had first recorded the song more than 55 years ago. Laura Veirs then returns alone to the Crescent stage half an hour later and takes the sell out crowd (tickets for this show had all been snapped up weeks in advance, such is Veirs’ popularity) on an absolutely wonderful journey across the highways of her (almost) entire discography, chronologically from a quite beautiful ‘Through December’ (taken from her second album, The Triumph and Travails of Orphan Mae) to material from her latest offering, last year’s The Lookout, a record described by The Guardian newspaper as “her most satisfying yet”. Perhaps surprisingly, Veirs only opts for three songs from The Lookout of which her interpretation of The Grateful Dead’s ‘Mountains of the Moon’ (tucked away as the final song on side one of a vinyl copy of the Dead’s Aoxomoxoa) is perhaps the most impressive. Veirs plays it as her first encore tonight and sticks to the original’s simple acoustic arrangement, retaining all of its magical splendour in the process. 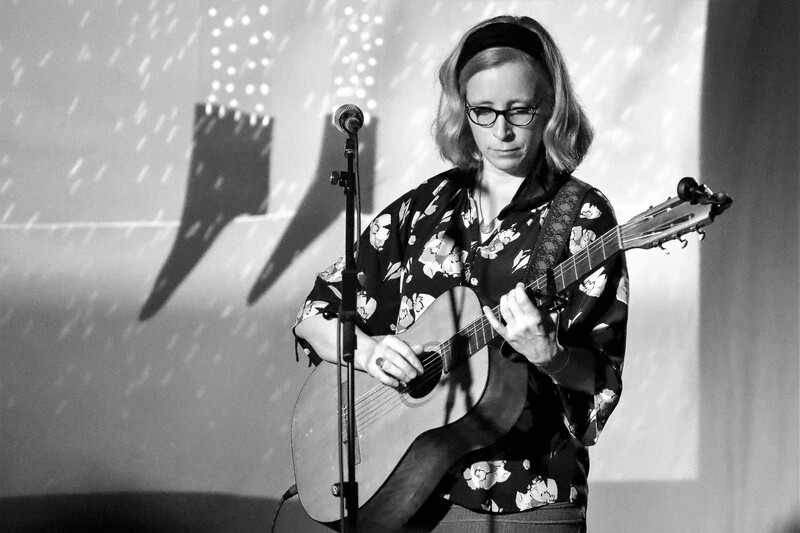 The majority of the songs that Laura Veirs performs here are drawn from her 2010 long player, July Flame, a record many would regard as still being her best. But regardless of personal opinion, every song she plays this evening (a whopping 17 in total!) is characterised by delicacy, empathy and balance, and underpinned by an almost childlike wonder at times (a feeling reinforced by the series of images projected onto the screen behind her; Veirs’ own sketches of concentric designs, birds on a wire, floating jellyfish and huge prehistoric beasts roaming the visual landscape). It all makes for a really rather delightful evening. Laura Veirs and Sam Amidon at The Crescent, York was brought to us by Please Please You.